The City of Compton has seen double-digit declines in gang-related shootings and homicides and an overall decrease in chronic violence, after a three-year partnership between the United States Department of Justice, Compton and the Los Angeles County Sheriff’s Department (LASD). 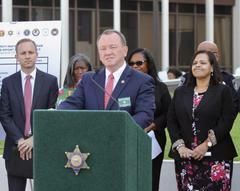 On Tuesday, September 11, 2018, Sheriff McDonnell, Assistant United States Attorney Justin Rhoades and Compton City Councilwoman Janna Zurita stood with officials from the Federal Bureau of Investigation (FBI), Drug Enforcement Administration (DEA), Bureau of Alcohol, Tobacco, Firearms and Explosives (ATF), Los Angeles County District Attorney’s Office, Los Angeles County Probation Department, United States Marshals Service, and Compton Unified School District Police Department and offered details of a collaboration that netted more than four thousand arrests, several federal indictments, and hundreds of illegal guns confiscated and more than 270 pounds of narcotics including enough Fentanyl to kill nearly four million people. In 2015, the Obama Administration’s Department of Justice selected Compton for what launched three years ago as the Violence Reduction Network (VRN) of more than ten cities across the nation working closely with the federal government to reduce chronic violence in their communities. This program provided the LASD Compton Station technical resources, training and the ability for the Department of Justice and local officials to work together seamlessly to address twelve key areas of focus, including gang violence and prevention, human trafficking, mental illness and homelessness, at-risk youth, and trust-building in the community. The outcomes speak volumes: 4,092 people were arrested and/or indicted, 636 illegal firearms were taken off the streets, 80 pounds of explosives were seized, 647 pounds of illegal narcotics such as marijuana, methamphetamine, cocaine and heroin, and 18 pounds of Fentanyl were removed. The VRN will continue as the Public Safety Partnership (PSP). The United States Attorney’s Office worked closely with the Los Angeles County District Attorney’s Office to coordinate criminal prosecutions in federal and state courts. Nick Hanna, United States Attorney, Central District: "As a result of the truly integrated nature of this project, we have seen tremendous successes in confronting the crime problem in Compton. I am confident that we will continue to improve the safety and security of Compton neighborhoods, because of the training provided over the past three years, the data were have gathered and analyzed, and the commitment of each and every participant to continue the partnership designed to keep this great community safe and thriving." Bill McMullan, Special Agent in Charge of ATF, Los Angeles Field Division: “Public Safety Partnerships effectively combine federal, state and local law enforcement resources to help protect our communities. Through this initiative, more than 300 guns were taken off the Compton streets and out of the hands of criminals by ATF. We will continue to build on these strong partnerships and remain committed to proactively identifying and targeting gang members involved in violent criminal activity. The Public Safety Partnership provided the Sheriff’s Department with technical assistance and access to resources as part of a robust violent crime strategy supported by federal, state and local law enforcement agencies. The Justice Department program maximized its access to resources to ensure cities dealing with chronic violence have a strategic way to access resources, such as training and exposure to evidence-based best practices across the country. 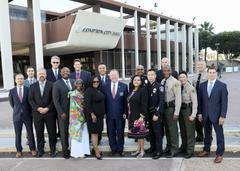 Cecil W. Rhambo, Jr., Compton City Manager: "The Public Safety Partnership has brought tangible results in Compton's targeting of specific crimes. The statistical proof is beyond debate. This is an example of how intergovernmental cooperation is executed to succeed." The Public Safety Partnership program will continue with a five-year sustainability plan.